Let’s be real. 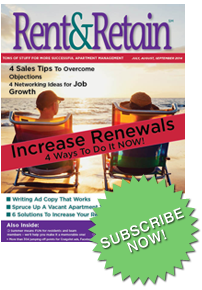 No resident is truly shocked when they receive a lease renewal notice with a rent increase. Renters are conditioned to expect some kind of increase every year. The truth is that it’s not the dollars that get the resident riled up, it’s what they feel they are getting (or not getting) for those dollars. A $10 increase may as well be a $1000 increase if no one ever picks up the phone at the leasing office or it takes a week to get a routine service request completed. Serving the resident as though they are a member of an exclusive club rather than just a paying customer increases the value of their home exponentially. This is their home. They want to feel comfortable. They want to have pride in where they live. So, if a resident has lived there for more than 5 years and the carpet was already a few years old when they moved in, offer to replace it! You’re going to replace it if they move out anyway. Why not just make the effort and reinforce that pride? Are you rehabbing the property, but it’s going to be awhile until you get to a long-term resident’s home? Why not at least upgrade something simple in the mean time? Maybe the bathroom light fixtures? Tear out those Hollywood lights, put in some cans. Is the oven ancient and continually needing service? Again, you’d replace it during a turn anyway, so why not replace it now and show the resident you care about their comfort and their residency! rent payments or extended office hours a couple of nights a week to accommodate a population who is working later and later hours – these are relatively easy adjustments that make life so much more convenient for residents. When it comes to reasons for not renewing, more than two-thirds of those reasons are things the community team can influence. It’s a matter of thinking in terms of what matters most to residents and being willing to make it worth their hard earned dollars to stay. Jen Piccotti, Senior Vice President of Education and Consulting, heads up client support for SatisFacts, including resident feedback analysis, satisfaction survey action planning, online reputation management coaching, productivity studies, and educational services. Jen has over two decades of customer loyalty and process efficiency experience, and is a multifamily industry veteran since 2000. A noted author, keynote speaker and highly followed blogger in the multifamily industry, contact her at jpiccotti@satisfacts.com.